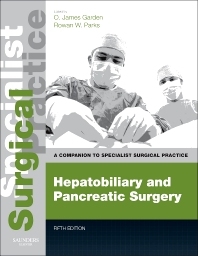 "This book is a concise, useful and up to date source of information for speciality registrars and practising consultants in the field of hepato-pancreatico-biliary surgery." "This is an updated edition on hepato-pancreato-biliary (HPB) surgery in a series of well-written and well-referenced books. Regius Professor of Clinical Surgery, Clinical Surgery, University of Edinburgh; Honorary Consultant Surgeon, Royal Infirmary of Edinburgh, UK.